Berkshires resident James Taylor, a Tarheel by birth, returned to North Caolina to headline CarolinaFest on Labor Day in uptown Charlotte and to rally the delegates before President Barack Obama takes the Charlotte Convention Center stage to accept his party’s nomination for president. Taylor, who has been involved in politics throughout a professional career that dates back to the Vietnam era, last month played the same role when First Lady Michele Obama came to the Berkshires for a fund-raising rally at the Colonial Theatre in Pittsfield, MA. James Taylor One Man Band show Tanglewood Aug. 24, 2007; BerkshireLinks.com photo. 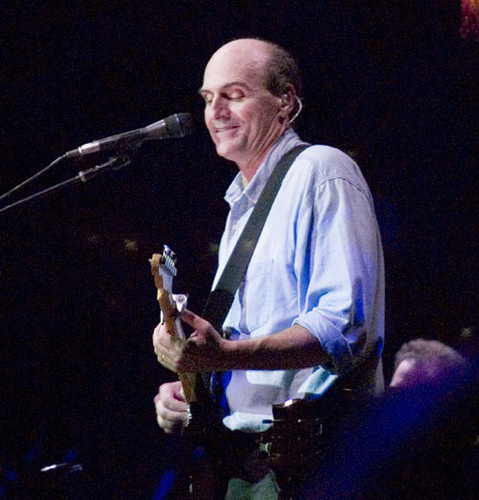 It was an especially busy summer in the Berkshires for Taylor, who performed at two special events in addition to the annual James Taylor concerts at Tanglewood, the BSO 75th anniversary concert, and his friend John Williams’ 80th birthday concert.